Healthy living isn’t just a fad for the New Year; it’s always good for your body and mind. It involves fostering good habits, helping you live longer and more comfortably while avoiding infections and other problems. Some healthy living habits can even help your toes avoid issues like fungal infections. Since toenail fungus is notoriously difficult to eliminate, preventing it in the first place is your healthiest option. Trim your nails right – Toenails should be trimmed straight across and reaching the end of your toes, so they don’t curve into your skin or cause other problems that could allow fungus in. Wear shoes that fit well and allow air in – Shoes that bash against your toes can encourage small separations between the nail and nail bed, so stick to styles that fit correctly. Look for shoes that allow air to circulate as well. Don’t pick at your nails or skin – Fungus gets under your nails through tiny breaks in the skin or separations between nails and toes, so don’t pick at your feet and create those openings. Wear moisture-wicking socks – Choose socks that pull moisture away from your toes, so you don’t foster a sweaty, fungus-friendly environment around your feet. Then wear a fresh pair every day. 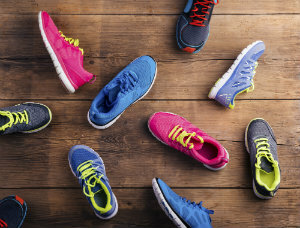 Throw out old shoes – Old shoes are not only bad for biomechanics and general walking, they can also play host to old sweat, bacteria, and fungus, so throw them out. Wash and disinfect regularly – Wash your feet every day. You should also wash and disinfect your footwear periodically, so it stays clean as well. Fungal toenails are common, but the right healthy living habits can be a huge step toward preventing them altogether. The more you invest in your foot health now, before a problem arises, the better it is for your feet and toes in the long run. Let our team at Dallas Podiatry Works help you develop those healthy habits and take great care of your toes. Contact our Dallas and Plano offices for more information today. You can use our website to learn more, or call us directly: (972) 566-7474 for Dallas, or (972) 943-3323 for Plano.